I'll never forget the first time I heard you, as I was having lunch - roast beef on a bulkie with Russian dressing - in a little sandwich shop called Hazen's, on my first day in Cambridge, Massachusetts, when someone played "Brown-Eyed Girl" on the jukebox. Little did I know that even better things were to come. Take back this pudding. It has no theme. One year ago tonight I started this blog. I did it because a group of posters on the Fray (the online discussion group appended to Slate magazine) was starting a writing group, and decided to publish their contributions through blogs. I had thought about blogging before, but assumed there was some financial outlay involved in getting set up. The organizer of the Fray writing group gave directions on how to set up a blog on Blogger, and I followed them. Having set the thing up, I began using it to publish whatever came across my mind, all unrelated to the writing group, to which, I'm afraid, I never contributed. Why the awful name? Shortly before I set up the blog, I saw the phrase "self-absorbed boomer" in several contexts. I was born in 1946, so I'm on the leading edge of the post-World War 2 baby boom, and my wife does occasionally accuse me of being self-absorbed. So I put it down, with the thought that, since I wasn't likely to draw a big readership, I could always blame the blog's lack of popularity on its title (or, should it enjoy any degree of success, revel in its having succeeded despite its name). Anyway, changing it now seems like too much of a hassle. So, what's it all about? Well, despite the name, it's nothing like Jonathan Franzen's memoir. It is self-absorbed in the sense that it includes stuff about a number of childhood fascinations that I've never lost (dinosaurs, ships, trains) as well as ones I've developed later in life (architecture, baseball, economics) which, taken together, are, if not unique to me, certainly not a constellation of interests likely to coincide with those of a very large group of people. What I'm doing is taking the long tail theory to a length it probably can't reach. If, say, someone with a strong interest in architecture hits on my blog when that's the topic of my top post, she may bookmark it and come back. But if she then finds a post about college football, she may give up on it. If this were a business, and I was depending on it for my sustenance, I'd disaggregate; that is, I'd have "Claude's Baseball Blog", "Claude's Life in Brooklyn Heights Blog", and so forth. But it's not, and I won't. One thing I am going to change. I'd like very much to hear from you; to get your reaction to the blog in general and to what I've written about it here. However, with a few exceptions (mostly fellow Fraysters), people have not been eager to leave comments. One probable reason is that I've not allowed anonymous comments. I'm going on to Blogger Dashboard now to change that. Please feel free to comment anonymously if that's the only way you're comfortable doing it. Thank you all. Here's hoping we can do this again one year hence. 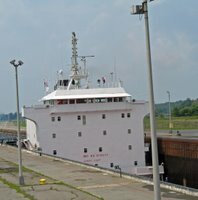 About a year ago, I posted about a visit to Eisenhower Lock, on the St. Lawrence Seaway at Massena, New York. 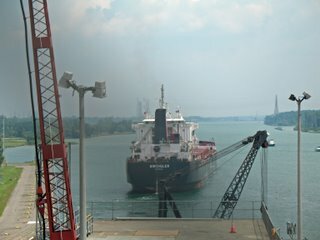 What I didn't do then was document the entire process of a ship locking through. 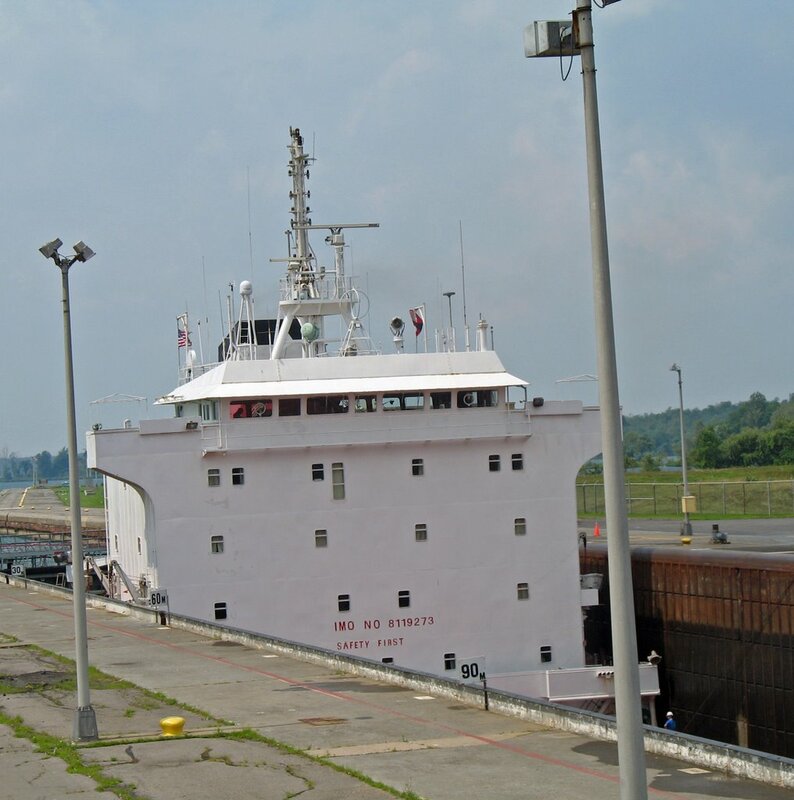 On my recent visit to Massena, I checked the traffic report on the Seaway website and noted that the Birchglen was due at the Lock in a couple of hours. 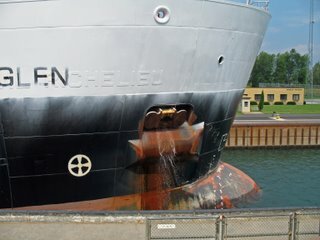 I got there in time to see her enetering the lock. 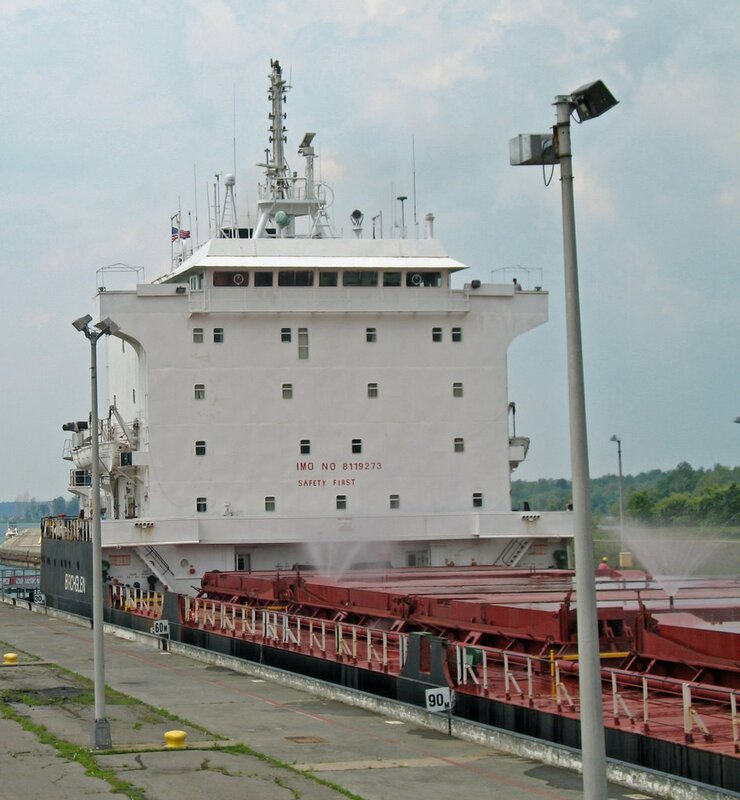 Birchglen proved to be a new style Great Lakes bulk cargo carrier, or "laker", in that she has both her bridge and engine room aft instead of having a separate wheelhouse and crew quarters perched on her bow (compare with the photos of Frontenac in my earlier post linked above). 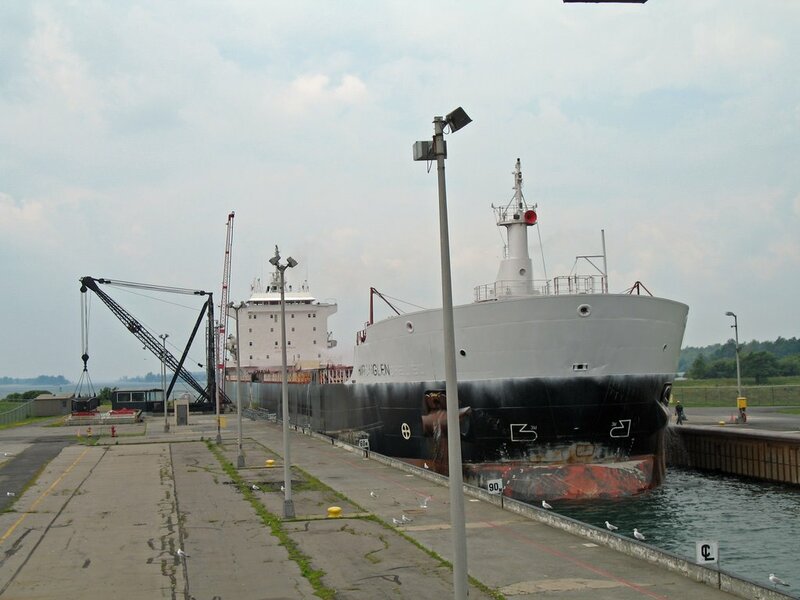 In this respect, she looks like a typical oceangoing bulker; her laker pedigree is proclaimed by her very rounded bow, which contrasts with the sharper-edged stem of a typical "salty", and her relatively narrow beam compared to her length, which enables her to fit the Seaway locks. These photos show Birchglen's superstructure in a full lock (having come in from the west), and after the lock has emptied to the level of the Seaway downstream. 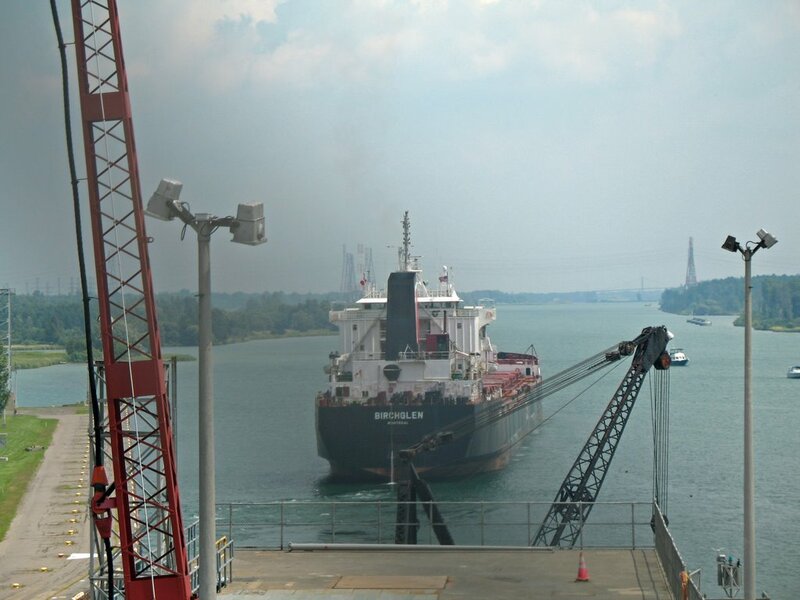 This lowering of a 35,000 deadweight ton vessel (or raising of a vessel going in the opposite direction) is accomplished by the force of gravity; the only electric energy used is that needed to open and close a couple of valves. 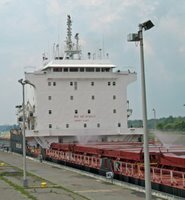 Finally, we see Birchglen, having left Eisenhower Lock, sailing down the St. Lawrence toward her destination, Quebec City, where her cargo of grain will either be transshipped onto oceangoing vessels for transport overseas, or, perhaps, be milled into flour to make baguettes for hungry Quebecois. "As I recall from my super brief stint as a sometime admiralty lawyer (wish I'd been able really to learn the stuff; it was quirky and fascinating in many respects, though it could be frustrating as well. 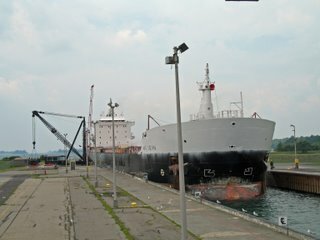 Because of goddamn name changes, even while the vessel was at sea, I once lost a tanker for a while), it's often that a vessel is a corporation's only asset, and when there are liens against the corp or other liabilities, the principal "transfers" the vessel to "another" corporation, changes its name, and puts the first corporation in bankruptcy. Or something like that. It wasn't as much, always, about taxes as about crookedness and avoiding liability. But maybe that kind of thing isn't as easy anymore." Second update. A very big thank you to Homer Fink of Brooklyn Heights Blog (today featuring a photo of Robert Moses, who, coincidentally, was one of the principal promoters of the St. Lawrence Seaway, looking very predatory under his broad-brimmed fedora) for telling me how to link directly to an old post instead of to an entire month's archive. I've fixed the link in the first sentence of this post accordingly. New dino species found in Brazil. South America seems to be the hot spot these days for dinosaur discoveries. At 39 feet and nine tons, Maxakalisaurus topai isn't particularly big as sauropods go, but this Reuters article points out, it's a significant discovery because it appears to provide an evolutionary link to a branch of the Titanosauridae found in more recent Cretaceous formations in Argentina. Kids may love or hate it based on its name. I'm not sure how the Maxakali, the tribe from which the name is derived, pronounce the "X"; i.e., is it "Macks-a-kal-i" or "Mash-a-kal-i"? I'm very impressed by the reconstruction of the head of the theropod Mapusaurus roseae, which you can find by scrolling down a bit in the linked article.